Original article from The International Calculator Collector. When Ed Price returned in 1971 from studying in England, he had intended to design and develop a wireless microphone, a very new product for the time. He had been following the latest trends in electronics, especially the burgeoning integrated circuit (IC) technology, and wanted to get involved in state-of-the-art products. But he kept coming back to a knawing desire to build his own electronic slide rule. In mid 1971, portable calculators were 1-1/2 pound behemoths that cost $400 (in 1971 dollars), performing just four functions. While he wasn't aware of Ed White's efforts at Bowmar to produce a smaller and cheaper model, Price saw the potential (and the future) of electronic miniaturization. By the fall of 1971, Price had a working model. He recalls how excited he was when he first turned it on and the digits all worked as planned. Well, sort of. He made a minor (and easily correctable) error in the order of the LED drive circuitry and the order of numbers were reversed, running left to right (1xxxxxxx) instead of right to left (xxxxxxx1). That didn't dampen his joy: he knew the design was a success. Manufacturing and marketing was the next step. Price contacted Nuclear Controls and Electronics (NCE), a local Salt Lake City, Utah (USA) electronics company. The owners immediately saw a perfect match with their desire to diversify their rather limited product line and link to profitable opportunities in the new growth industry of electronic calculators. They made Price an offer to exchange his ideas for stock in NCE. In addition, he would also lead the effort to produce the new calculator line. Summit, a marketing company aligned with NCE would handle the sales and distribution. By March 1972, the NCE1 was being sold in stores for just under $200. Summit's first model looked just like Price's initial kitchen table prototype. At the time the NCE1 and Summit's next few models (at approx. 4x3") were the smallest on the market. That year Summit sold 4 million dollars in calculators. Indicative of the product's market, the next year they generated $12 million worth. In 1974 revenues were just a bit higher, but by then Summit's calculator operation was starting to unravel. Most Summit hand-held calculators have a very distinctive "boxy" design, as in this Summit Ko9V. Note the use of the equally distinctive Texas Instruments "Klixon" keypad, with the keys dominating the design. Trans Atlas took over NCE and Summit in 1974. Soon after, $4 million sale of calculators to a distributor in Europe went bust as his line of credit dissolved in a last minute error (after the calculators were shipped overseas). Summit never received what was due them or were even able to get the calculators back. That kind of sizable loss badly hurt the company, which had already been feeling tremendous pricing and profit pressures from the glut of manufacturers in a maturing market. 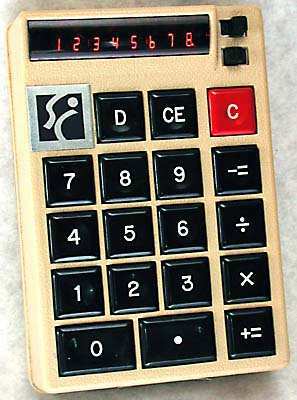 By the end of 1974, Summit was no longer making calculators. Ed Price, however, hadn't given up just yet. He moved to Chicago and tried one last time with a new company, Price Research Associates. Price came out with his smallest model yet -- the Wisp. This 3 ounce, 3-3/8 x 2-1/8 x 7/8" model was designed for one handed operation (you actually just needed your thumb). The Wisp was available in designer colors. Over it's several year history, Summit produced over 25 different models with some of the smallest on the market. Features on the calculators ran from the standard four function to those with scientific and metric conversions. One limited production model was built with features designed for airplane pilots. Summit produced several desktop models and even was working on a prototype for a LCD model just prior to shutting down production. Most of the models sold 20,000 to 50,000 units each. Summit's are known for their very small, box-shaped models, usually with nicad batteries so the owner didn't have to change batteries. A later model series in 1974 used a more stylishly designed, but still very small, case. Ed Price's greatest memories? He can vividly still remember turning his kitchen table prototype on and it working -- much to his joy (and a little surprise, one would think). And much like a father seeing his baby grow up, he also remembers walking out onto the production floor of NCE and seeing hundreds of people carving out his original idea and designs into one of the most exciting products on the market.